Floodwaters and plumbing incidents are messy, that’s for sure. Even water from a clean source can quickly become a toxic soup when intermingling with contaminants and debris. But no flood event is nastier right off the bat than raw sewage. 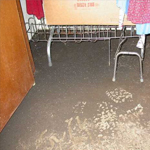 When you have a sewage or septic backup or overflow, you have a major mess on your hands. Not only is this an unpleasant job for the average homeowner, it is not a do-it-yourself job due to the bacterial dangers involved. We offer a complete cleanup service which includes cleaning up the mess and disinfecting all contaminated items and surfaces. We understand the dangers involved when coming into contact with raw sewage and take all necessary precautions to protect the health of our workers as well as the health of your family. Depending on the nature and extent of the sewage and septic incident, some building materials may need to be replaced including carpets, wallpaper, and drywall. As a full service contractor, we can help you with these repairs as well.